December 30, 2015 Asmaa Alanbari on identity, culture and the body. 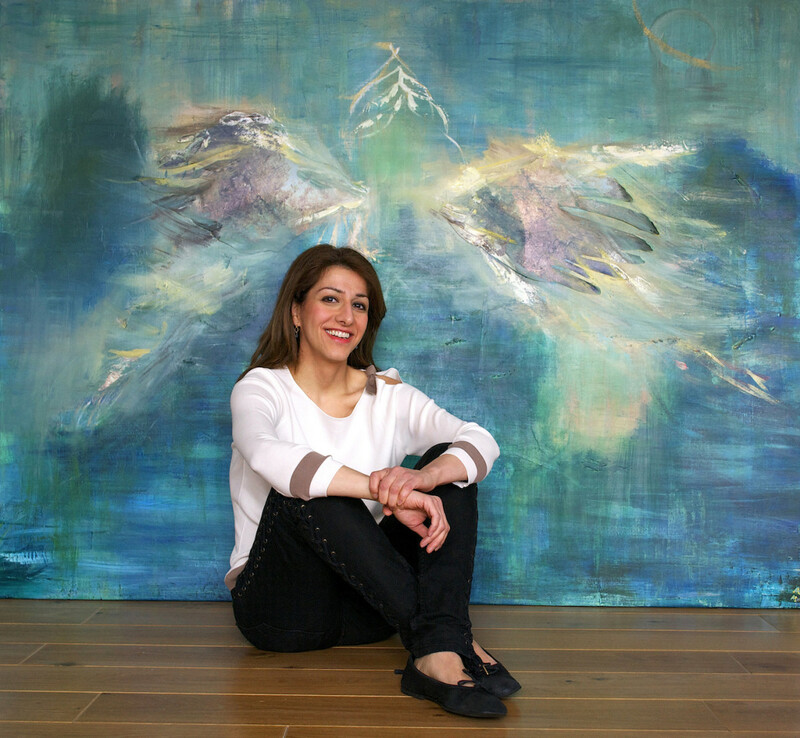 Asmaa Alanbari is an Iraqi born visual artist and creative director based in London. Her work deals with identity and cross cultural dialogue through the painting and photography of the human body. She directs public art events and projects, such as art exhibitions and other interactive cultural events. One example is a program called “Self Development Through Art”, which she founded and taught at The Saatchi Gallery. 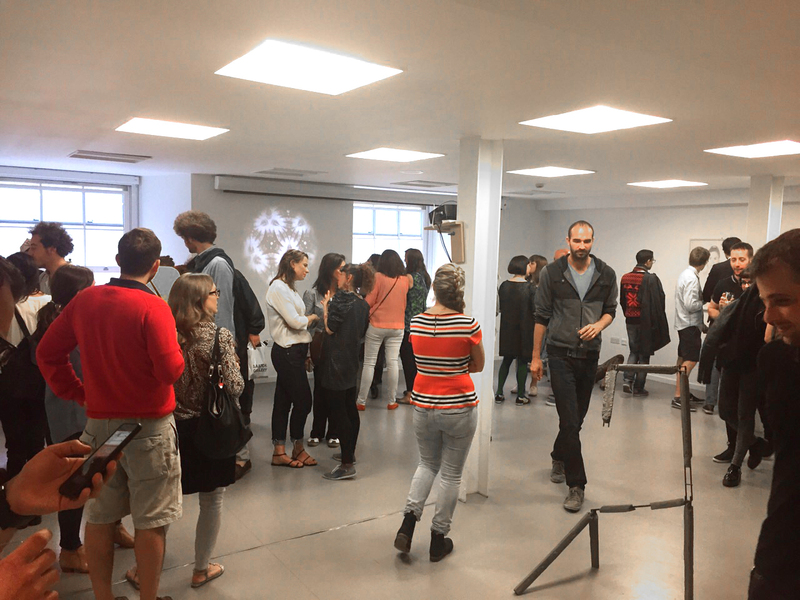 The workshop was the first in London to shift the focus towards the learner’s self development rather than on the mastering of technique. Recently, she has co-curated the art exhibition “In Between”, also at The Saatchi Gallery, and has just completed her Masters in Fine Art at London’s Chelsea College of Art. Her outlook is cross cultural and cross disciplinary as proven by her past degrees in architecture from L’Ecole Speciale d’Architecture in Paris and The London School of Economics. Fantasmaa, 2015. Courtesy of the artist. Your work deals with identity, the body and metaphor. How do you explore these themes? I was born in Baghdad but I spent most of my life in Paris, the US, London and Patagonia. I belong to all these cultures, and I understand identity as fluid and changeable. Places can inhabit the body and to some extent the spirit. I create spiritual nudes, where visual metaphors represent body parts. 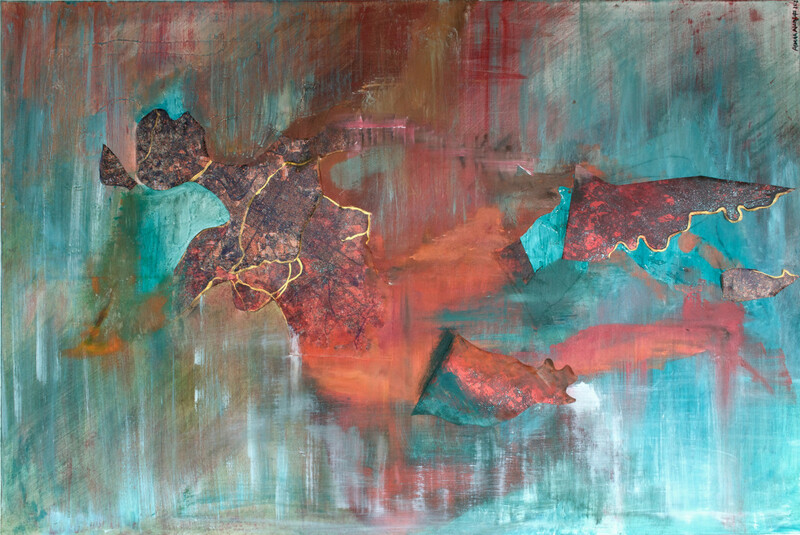 In my painting Vision of Peace, satellite images of cities depict the spiritual interior instead of flesh. The head and chest are made up of Baghdad. The legs of the lady are actually a satellite image of the river Thames in London. 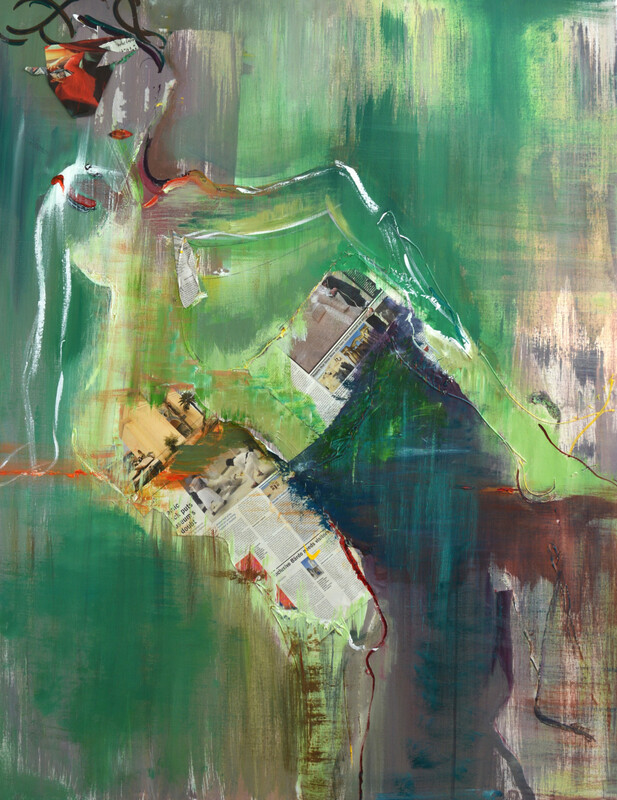 The torso is the result of the two cities digitally superimposed and make up her gut.The physical body is the most honest expression of oneself. It is too often made synonymous with sexuality, which in reality is only one aspect of the human body, male or female. I quote the writer, doctor and human rights activist Nawal Al Saadawi when I say that clothes, make-up, headscarves, and branded items are things you add on to gain self and social acceptance. Another example is Fertile Crescent II, where newspaper cuttings of important events are used metaphorically as body parts. I was haunted by images of the Islamic State (IS) destroying ancient artifacts and used that imagery to make up the heaviness in her legs. I felt hope with an article written by film director Luc Besson after the Charlie Hebdo attack in Paris, where he regrets how the name of Islam gets unfairly used to further political violence. 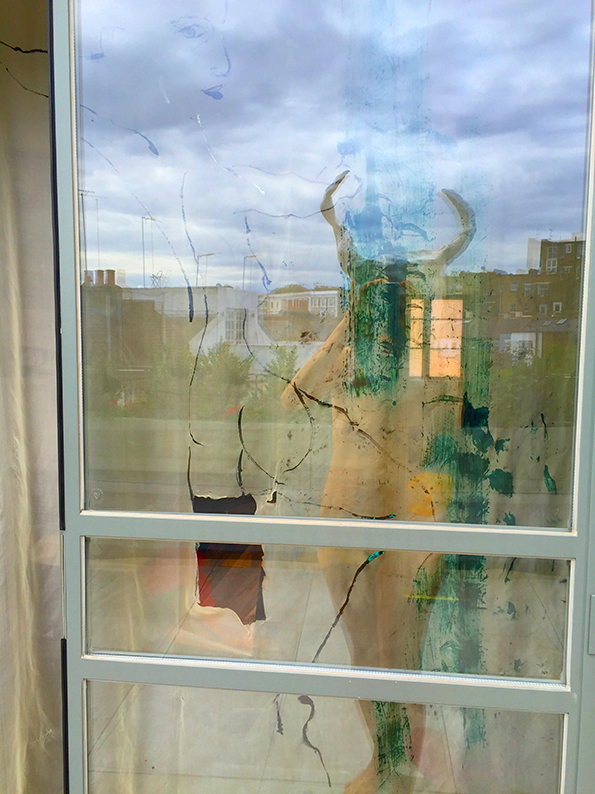 The result, in my art is an image of a person whose insides are literally a recording of her time, of our history. Vision of Peace, 2013. Courtesy of the artist. 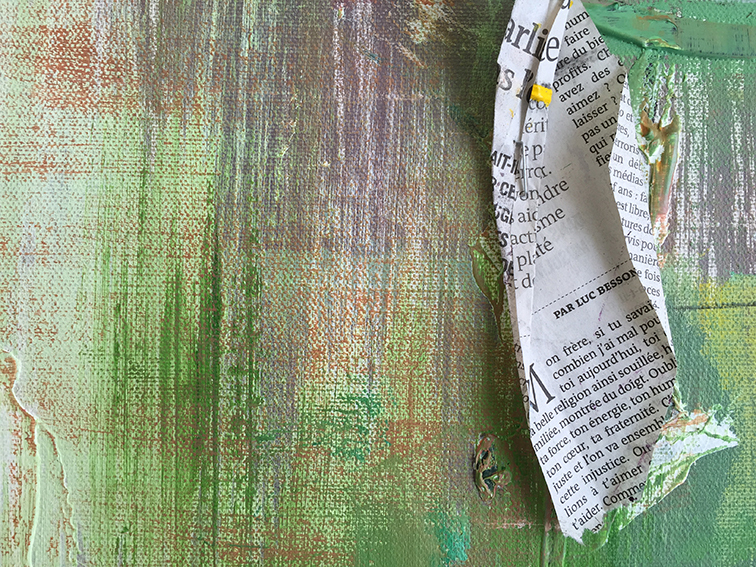 Fertile Crescent II (detail), 2015. Courtesy of the artist. How has your work developed or changed since joining the Chelsea College of Arts a year ago? Today I would be satisfied with my art if there was something alive about it. It should have several layers of meaning and be open to personal interpretation by the viewer. In my thesis entitled “Fantasmaa”, photographs of several layers of light reflected create an interior landscape. I show the outside physical world at the same time as the interior psyche of the person depicted. You worked as Creative Director for the “In Between” art show at The Saatchi Gallery. What was your vision for it? I came up with the vision for the show because I often can identify with very contrasting people, ideas and points of view. For example, I am contemporary and I am traditional, I am East and I am West, I am free and I am not. I have come to realize that identity is not rigid, that it is in a state of flux. I came to be fascinated by the idea of the in between as a legitimate state of being. It is about celebrating the exceptional, people who go against the trend, those on the fringe and those who aren’t today but who will be at another time. Opening of the “In Between” Art Exhibition at the Saatchi Gallery, 2015. Courtesy of the artist. You co-curated the show with Israeli artist Eden Lazaness. What do you hope the artistic collaboration between an Iraqi and an Israeli will achieve? What did you learn from it? She is an Israeli but she is a pro-peace activist who does everything she can to counter the injustice Arabs today have to live through in Palestine whether it is in her voting or professional capacity. It is important for us to empower people like Eden, who are today a minority in their home countries, so that their voice can be heard better. We should know and show that we are capable of cooperation and peace when the terms are egalitarian. 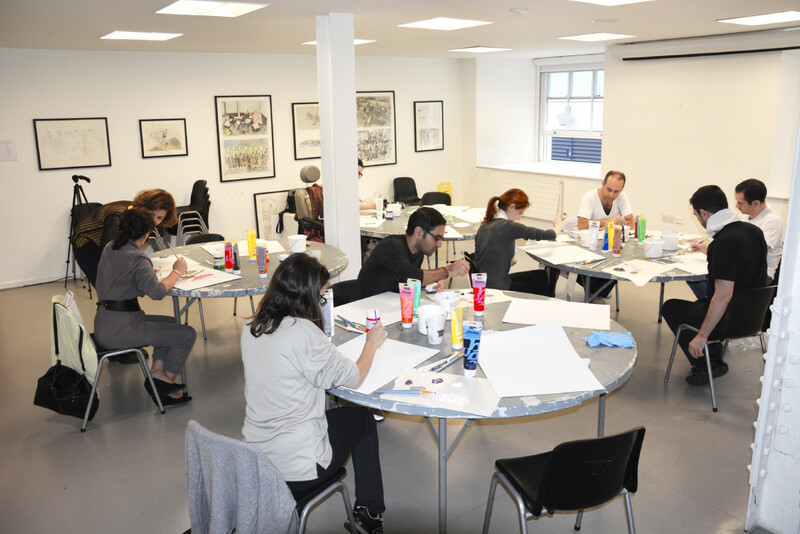 A “Self Development Through Art” workshop Alanbari taught at The Saatchi Gallery, London. Courtesy of the artist. Can art help resolve a conflict like the Arab-Israeli one? How so? Peaceful ideals can be hard to achieve though art can facilitate change through new types of imagery and collaborations. An ideal is essentially a dream, intangible and elusive. By giving it form and image, art brings it a step closer to becoming real, providing a first building block. Art taps into the emotional self, it is therefore powerful as it can move people regardless of political affiliations. Lets consider the example of a politically embittered person who comes to the classical music of Daniel Barenboim. They can only hear his music on a physical instinctive level before they can remember his origins. In conclusion, my role is to remind people of their humanity, and to create objects and experiences that are full of life. Asmaa Alanbari in front of Hope, 2013. Courtesy of the artist.